I am participating in the recipe exchanges on the Balancing Beauty and Bedlam blog and Blessed with Grace. Here leaves don't change until the first week of November usually; but we have had cooler weather in Northeast Oklahoma recently which made us think of fall sooner than normal. 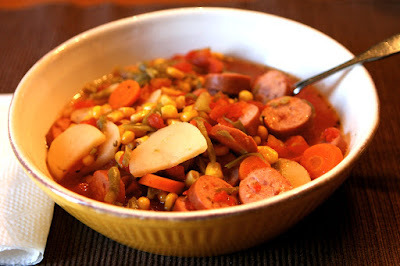 My mother, known by her grand-girls as BeBe, got out the family favorite sausage stew recipe. We aren't sure where it came from and I have seen many variations over the years. But this is absolutely the best and easiest stew to make. Step One: Open all cans and put in crock-pot. Step Three: Put sausage in crock-pot. (1) Fat-free chicken broth, (1) diced tomatoes-Basil, Garlic, & Oregano, (1) Sliced Potatoes, (1) French cut green beans, (1) sliced carrots, (1) Shoepeg corn, and (1)original Rotel. If you use turkey sausage it will be about 130 cal. for two cups of stew. And feel free to use duck sausage if your husband literally brings home the meat. It is all good. The secret I think is the Rotel!